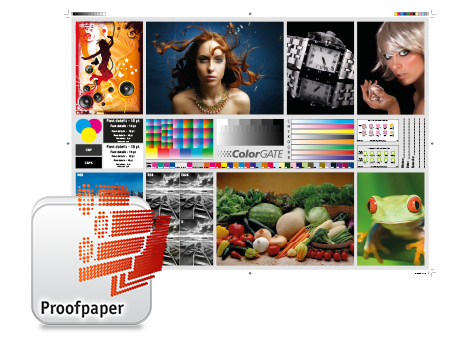 The best quality available on the market – at a sensational price: CG Isoproof from ColorGATE, the color management specialist, demonstrates brilliant color reproduction and finest color nuances. Optimally suited for use with the water-based inkjet printers of such leading manufacturers as Canon, Epson and HP. CG Isoproof is Fogra certified (200 and 245 g/m²) and available as Isoproof 51 and Isoproof 39. CG Isoproof Media meet the requirements for the binding simulation of substrates according to ISO 12647-2: 2004 PC 1 (Isoproof 39) and ISO 12647-2:2013 PC 1 (Isoproof 51) at a consistently high level of quality. CG Screenfilm Waterbased is the perfect daylight medium for high-end screen-print production and is able to deal with even large ink amounts .The special coating ensures excellent UV densities up to 3.5*. In addition, CG Screenfilm Waterbased exhibits an impressive vacuum behavior and perfect compatibility with all popular screen-print emulsions. CG Screenfilm Economy can be produced at significantly lower cost due to its lesser thickness and thinner coating.